Yalova Group Belediye Spor (TBL) signed 25-year old American forward Stephen Hurt (211-120kg-93, college: Kansas State). He joins another USA player Kyle Washington who is already in the roster. 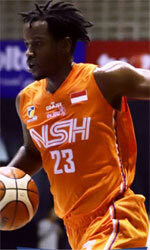 Hurt started the season at CLS Knights in Indonesian IBL league. In 8 games he had 14.3ppg, 8.6rpg, 2.1apg and 1.1spg this season. The last season he played at Al Rayyan (D1) in league where in 13 games he recorded very impressive stats: 17.2ppg, 11.2rpg (#4 in the league), 3.4apg and 1.3bpg. Great season as he was named to Asia-Basket.com All-Qatar D1 Honorable Mention. Hurt was voted All-A-Sun Freshman of the Year back in 2013 at his college time. Hurt has played previously professionally in Finland (Lapuan Korikobrat) and Slovenia (Hopsi Polzela). He attended Kansas State until 2016 and it is his third season as a professional player.